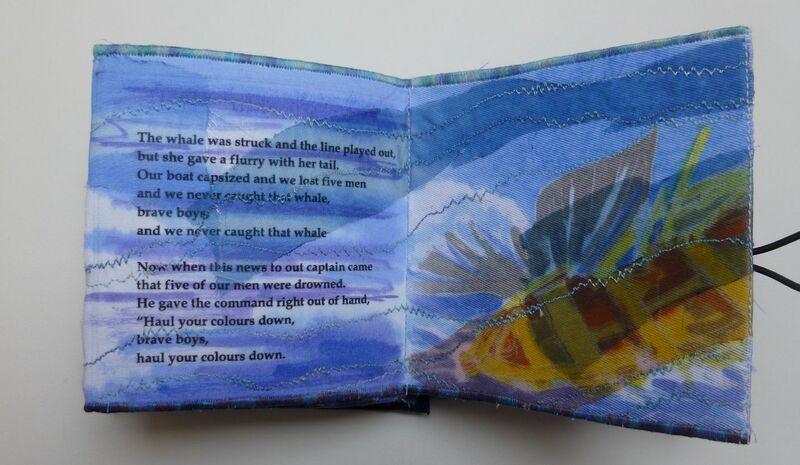 I’ve used some related imagery I’ve been working on for a while to loosely illustrate this traditional song about a whaling voyage in book form. I used a combination of digital printing on fabric and fabric paint for the lyric pages. The images were made using transfer dyes, layering burnt sheer fabrics and freehand machine embroidery. The pages run in a continuous concertina with the two covers able to be separated so that the all pages can be viewed at once as well as in traditional book format. The pages are 10cm square, so it’s not very big (and a bit fiddly to make in places).